Working with Art was one of the greatest experiences of my life. Not only is he an incredible coach, he cares about mental and physical wellbeing of the person he is working with. He is knows so much about the sport, and is overall a fantastic person. I wouldn’t have wanted to work with anyone else. Art Anderson is by far the best coach I’ve ever had. I started out running track in 3rd grade. By high school I was pretty good and thought I could make varsity, which I did. But season after season went by and I wasn’t achieving the success I desired. I wanted to be one of the top varsity athletes on our team and in the state. Junior year Coach Anderson asked if I wanted to be “good.” I said “of course” and began training with him. We went on to win a state championship that year and by my senior year I was a vital part of the team. My senior year season went amazing and we won state for a second time, all because of the Coach Anderson. His training had molded me into a top two 400m runners in the state. 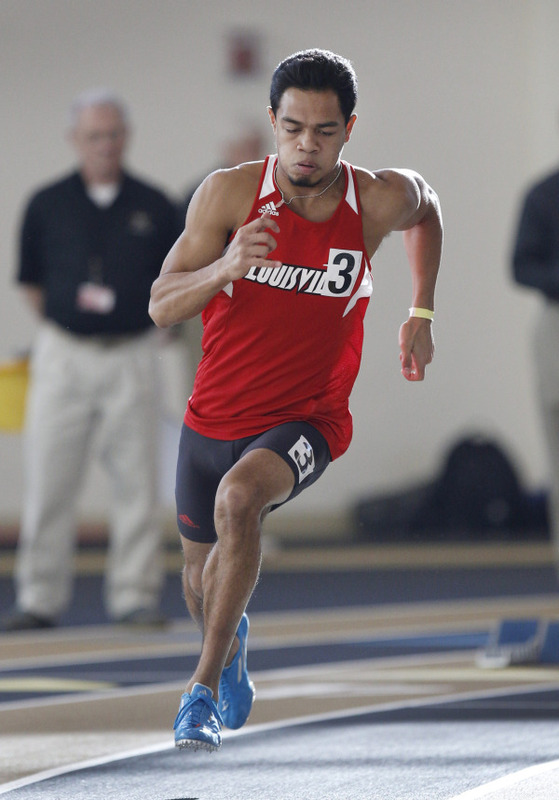 I am now running track at the University of Louisville, all because of him. His style of training is very intense. He also makes sure that before you begin to train that you set a certain amount of goals which you can hit. If you really commit yourself to his training you will succeed. It isn’t easy, but it is fun. I wouldn’t be where I am today without coach Art Anderson. Art Anderson has been the best coach I have ever worked with. I started working with him the summer of my junior year, and ever since then I’ve been the best I could ever be. Art’s training style is amazing, he helped me develop a better form to gain speed and he helped with endurance as well. He also helped me with my block starts, so I could get out faster. My favorite workout is probably hills because I get to work on just driving upwards. I remember my senior year every track meet I was so excited to run because I had better confidence in myself because of the training I was going through. Towards the end of my season I finally realized I had a chance to run in college. That’s when the thought occurred to me that I was not done with Track and Field just yet, and I still had more left in me. And today I now run at Western Oregon University. To train with Art I was completely dedicated because I wanted to succeed. Which goes to show if you stay dedicated to something you love you will eventually succeed. I give Art Anderson credit in my success, and even during holidays when I come home I go back and train with him. Coach Art is the reason I love track and pursued running into college. I am currently a D1 athlete at Seattle University as a 400 meter hurdler. The first time I ran a hurdle race was in high school, and with Art’s workouts I immediately saw improvement. I ran my first 300 hurdle race a 52.6, and by junior year I was down to 44.76 and a top 4 finisher at state. Art’s workouts are all about running 100% with a full recovery so you are consistently stimulating race pace, and by the time the race comes it’s second nature. Art’s technical attention to detail was extremely beneficial as a hurdler. He broke every part of my hurdle form down one by one and dialed it in drill by drill. Art created a sprinting community at my high school of kids all passionate to get better and push each other to be district and state champs. I continue to train with him when I’m home and he is still the only voice I hear when I race. I will never forget to drive my arms and trust my training because of Art. Coach Art has taught me everything I know about track. I entered into high school having no experience with track and had no idea about any sort of sprinting technique. I immediately started working and training with Coach Art and started to improve every meet. Coach Art is a huge reason why I was dedicated to track in high school and why I wanted to perform to the best of my abilities. With Coach Art’s training, I went on to sprint at a number of big meets in places like Washington and California and also qualified for the State Championship meet all four years of high school. Without Coach Art, my track career would not have been possible. He helped me set 2 school records and become a district champion and a silver medalist at the State Championship. Coach Art helped bond my teammates together and helped every one of us to reach different goals. He is constantly pushing his athletes to do better and knows the training it takes to improve and be successful. I am so thankful that I received training from Coach Art because he is truly the best coach I have ever had. Coach Art was the main reason I was able to excel in Track and Field and test my abilities to my fullest potential. Coming into high school I had never done track but I wanted to try out and see how good I could get. My first and second year I did well, I got better each day but it was only until I started training with Art the summer before my Junior year that I truly began to understand running on a technical basis. He taught the mechanics of sprinting and helped me improve my overall form which led to me becoming faster than I thought was possible. From Sophomore to Junior year I had gone from competing at the JV district meet to going to the State Championship and competing in the 4x400m and 200m. Senior year I was lucky enough to have him train me once again and I surpassed my previous limits. All of this was possible because of Art’s determination to show me my potential as well as his ability to make Track a fun and insightful experience. He is the best coach I have ever had and I have become a better sprinter and person because of his efforts to show me what I can do when I put in the time and hard work toward something I love to do. Coach Anderson is the best coach I’ve had the opportunity to work with. When I started running track in high school, I did it as a social move more than anything. I was always a fast kid, but never knew I was capable of being one of the top sprinters on the team. Coach Art took me under his wing, saw my potential and molded me into a division one athlete. He not only cares about growth of the athlete but the growth of the person. Sadly, I could not work with Coach Art through all of high school. He was a vital inspiration to me when deciding whether or not I wanted to run track in college. He is not only a great coach, but a great man. Coach Art took it upon himself to help after the conclusion of practice beginning day one. I started track my junior year in high school, having been a softball player the past 7 years, including playing on the high school team. Knowing nothing about hurdling, except for that I wanted to try it, Coach Art swept me under his wing and had me competing in varsity races after only 3 weeks. He cares about each and every runner equally, no matter your skill level. Any success I had as a runner can be directly attributed to his coaching during regular season and outside of it. Not only does he care about you as a runner, he cares about you as a person and has become a major role model in my life as well as a trustworthy coach/friend. Coach Art is very clear about what needs to be changed, and explains and demonstrates what steps need to be taken to become the best version of yourself as a runner and person. Coach Art is a great coach. He is not only a great sprint coach but a great person overall. You can tell that he cares for his athletes and wants the best for them. He is also very experienced in the sport and has a lot of knowledge on other events besides sprints. Art is very easy to talk to and is also makes sure his athletes are responsible not only on the track but also in life. He will check in with you about how school is going and make sure you are on top of things in your life. He is by far one of the best coaches I have had and also one of the most caring and compassionate ones. I cannot think of a better track coach in the Portland area with more experience, more connections in the sport, and more passion for the sport itself. When I started working out with Art, I had already been running track at a competitive level for 7 years. Art, however, took me to a whole new level. Not only did he show me how to train and compete at the highest level, but he also helped me be more confident in my running abilities. Slowly, Art exposed me to more strenuous training, and gradually prepared me to run at the college level. But besides training, coach Art is an amazing person. Extremely patient and understanding, Art will always be there when you need him. Time and time again he has gone the extra mile to train me, and more importantly guide me in the right direction. But above all, training with Art is like training with family. When me and my teammates train with him, I really feel at home. I’m extremely grateful to have had him as my coach for the past four years. My name is Amanda, and I will attend Glencoe High School as a Junior this year. I have been working with Coach Art for only 1 year and he is the most inspiring and dedicated coach that I have ever had. In times of self doubt, Art always pushes me to do my best and believe in myself. Having a coach that is as dedicated, technical, and as passionate as Art, has truly benefitted myself and many other athletes. Coach Art has helped me in many ways and I am excited for the next two years of working with him! Going into my freshman year of high school, I met Art while working out at the same track as him and his team and he immediately took me under his wing. Art not only helped me fall in love with track and field, but compete to my very best ability. He is by far one of the greatest coaches I’ve ever had. He has a unmatched level of passion and dedication for the sport of track and field. Art pushed me to not only be accountable on the track, but off it. My years of training with Art have been full of improvement, hard work and laughter. Art was one of the biggest driving forces that prepared me to be able to run in the PAC12 at the Division 1 level. I am extremely grateful to have as not only a life long coach but someone I can count on. Coach Art is hands down the greatest track coach. I came into high school track knowing nothing about starting out of blocks, exchanges, or what it looked like to compete on a high school team in general. He worked one on one with me to strengthen my abilities as a sprinter and he contributed to my two state rankings my freshman year. I had a lot of injuries through my track career and Art knew the proper way to help me heal while still staying in shape through the season. Coach Art’s commitment to his athletes is steadfast. Even though I don’t run anymore, he remains in contact with me and its evident he cares for his athletes. To have had him as a coach throughout high school was one of the biggest blessings. Anyone would be lucky to train with him. There isn’t one negative thing anyone could say about him as a person or a coach. It was a joy to work with him.